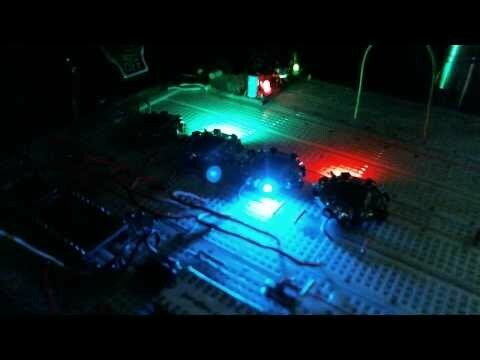 Are two circuits I designed with the propeller chip that both use rgb leds to do both emission of light, and detection of light. The names were chosen due to the shape of the leds along with the concept Forrest Mims made popular, led detection. 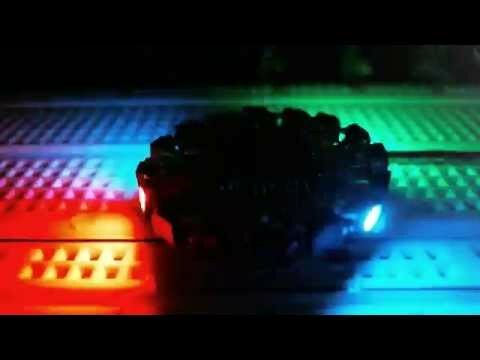 The first design, MimsMirrorZero is a circular shape with 8 rgb leds in circular formation around a prop. On the rear of the pcb is a crystal, eeprom, caps. Each output has a 100ohm resistor in series with one of the leds, or the common. 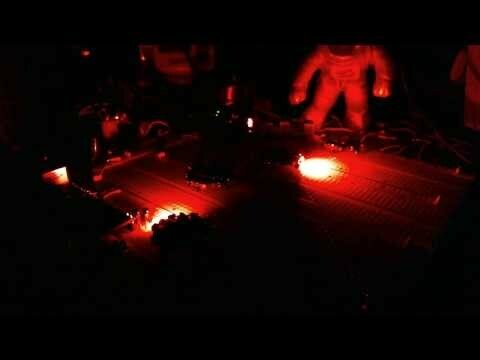 The commons also route to the prop, thus 4 legs x 8 leds = 32 input/output to leds. No multiplexing was done intentionally due to desire for quick detection response times. Every prop output is used in MimsMirrorZero for leds. Please see attached video for demonstration. If your video is black, change the quality, and rewind to beginning. Zero is almost exactly the same size in diameter as a quarter. The program the props are running in the video only turns on 1 led per step. I only run a single cog, and turn each lead on and then off sequentially. The duration of each led's on time is set in the program. I step through each led in a roation turning each led on and then off. My peak measurement in current draw was pathetic, 8ma peak. But this measures draw outside the inrush limiters, not between the prop and cap. 16.5ma peak, not even including vf of leds. (3.0vf for blue and green, 2.1vf for red) 2.1vf red = 12ma 3.0vf blue/green = 3ma. So it seems thats why im seeing 7ma average peak draw. What happens if I tweak the resistors to the limits of the cree leds.. do I need sunglasses? The inrush limiters are only used when using high uf smt capacitors and should really be around 2 ohm or so?. I used 1/2 because its all I had around. These LEDS require a very very low soldering temperature. The connection layout of both Zero and One follows proper design so that parallel programming(see link) and communication can be done with any number of MimsMirror Zero's and One's. link:= http://forums.parallax.com/showthread.php/127983-55-Parallax-Propeller-s-Parallells-Processing-of-Permanent-Perturbations. .................. OF OR IN CONNECTION WITH THE SOFTWARE OR THE USE OR OTHER DEALINGS IN THE SOFTWARE. " This is a first demonstration of a game type program that utilizes the detection of red and emission of red between 4 Zeros. I call it red wars. I have to start the zeros off with some form of red light, so I used a lighter as you can see. Sometimes I had to restart them right away, and other times, they kept going between each other. The only connection they have between each other is the led emission and detection, no wires, except power. The speed of the rotation and duration is set by the real.random object it is kept withing a certain duration to make the zeros stay alive for the most part. You don't want them too chatty, but sometimes they keep themselves going for a while. If a prop transmits red without activating another, the war will stop. This is an example of using the same led as emitter and detector in the same circuit. With some random type intelligence, and basic "rules of life"
Optic communication between intelligent 8-core beings? This forum has decimated old threads, so the code i put in code blocks here, IS GONE. MY ZEROS are infected with RED. Total: 22.36$ Not including engineering/assembly/shipping/stocking/PCB. Assembly skill level required(with my pcb): LETHAL- its too small. and 4- Ones having it out over RED. The Direction the leds chase in is random, and each colors length is also chosen at random. What you see in this video is completely random with core laws, like any system, its hysteresis needs to find the right resonance. If both zeros and ones turn off completely, it was luck. The hysteresis of this system of 8 prop chips communicating via red leds, sometimes allows it all to turn off, and other times its very active and chaotic. The response time could be improved with better code, better leds, etc.. Emergence : 4 Zeros and 4 Ones communicate with red photons. Ones are linear 7 rgb led devices with identical properties to the zero. 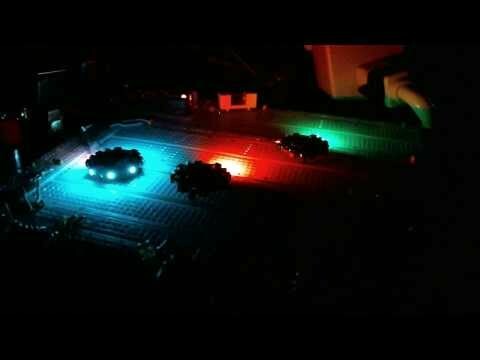 One can do what a zero can do, except use the 8th led programming. Nice, your breadboard will probably start charging a cover and open up a VIP line. I have tested expanding a zero into double the leds to be a zeroHD. 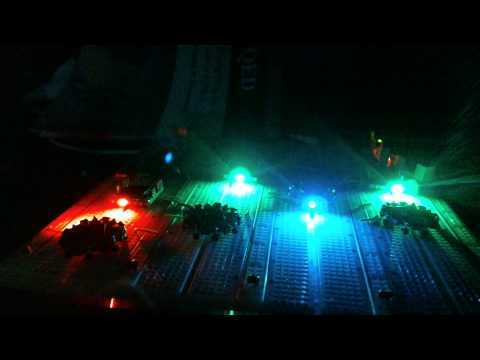 It has a total of 16 RGB leds, making this propeller chip control 48 individual leds directly. As you can see by the video each led can be lit individually. The limitation is that some Leds directly next to each other cannot be lit simultaneously. The prop can be communicated with and programmed. To communicate with the prop one a communication monitor would need to be programmed to look for communication in between the led output (because all 32 pins on the prop are used for leds. The forum change over killed old threads so im going thru worth while projects and fixing them. If the forum killed this project links, go here to find it. I suppose this one can be considered robotcs also, feel free to move it.